DAR ES SALAAM – The Uganda Cranes were handed a first defeat in the 2019 AFCON qualifiers as they lost 3-0 to Tanzania on Sunday. Simon Msuva, Mbwana Samata and Aggrey Maurice scored the goals for the Taifa Stars on a day that Uganda never really got started. Nevertheless, the result did not bother the Cranes a single bit as they entered the game having already qualified for the finals proper. Knowing that they need to score to stand a chance of qualification, Tanzania started brightly creating several half chances while Uganda sat deep to try and condense them. On 21 minutes, Allan Kyambadde failed to clear Uganda’s lines and he was robbed of the ball just inside the area. Msuva unleashed a fierce drive that was deflected by Kirizestom Ntambi and it went into the back of the net to hand Tanzania a 1-0 lead. Tanzania got a chance to double their advantage four minutes later when Michael Kamagi was fouled 25 yards from goal by Timothy Awanyi. Captain Mbwana Samata stepped up to take the resultant free-kick but blazed it over. The first and only yellow card of the game was shown to Hassan Khamis on 30 minutes, for fouling Allan Kyambadde as Uganda tried to kick-start a counter around the center-line. Inside first half additional time, Wadada sent in a cross from the right but Emmanuel Okwi was judged to have fouled inside the box before connecting with the ball. Tanzania started the second half like they did the first, dominating possession and taking the game to Uganda. On 50 minutes, Samata controlled a long ball inside Uganda’s area and tried to square the ball for a teammate but his attempted low cross was handled in the area by Ntambai. The referee pointed to the spot and Samata sent Ugandan custodian Denis Onyango the wrong way to double Tanzania’s lead. Eight minutes later, Tanzania defender Aggry Maurice stayed up after a free kick and he was at hand to node in the hosts’ third for 3-0. In response, Uganda made their first substitution with Milton Karisa replacing the under-performing Emmanuel Okwi. On 65 minutes, Uganda got their first real attempt on target with Nicholas Wadada trying his luck from distance but his effort flew over. Moments later, Tadeo Lwanga also shot from distance, calling Tanzanian goalkeeper Aishi Manula in action as he pushed the effort over for a corner. From the resultant kick, Karisa headed Wasswa’s corner wide of the target. Uganda made their second substitution on 68 minutes as Edrisa Lubega replaced Farooq Miya. With 10 minutes to play, Shaban Muhammad was introduced in place of Patrick Kaddu in an attempt to get some game time. 0n 84 minutes, Msuva made a breathtaking run down the right and attempted to catch Onyango off their line but the custodian was on hand to make acrobatic save to deny the Taifa Stars a fourth. The last opportunity of the game fell to Kyambadde but shot weakly after he was teed up by Shaban’s knock-down. Uganda finished the qualifiers on top of Group L with 13 points from six games having won 4, drawn 1 and lost one. Even before Sunday’s game, Uganda had already qualified for the AFCON finals proper. For Tanzania, the win saw them move onto 8 points from 6 games and finish second in the group to qualify for the AFCON finals in Egypt. 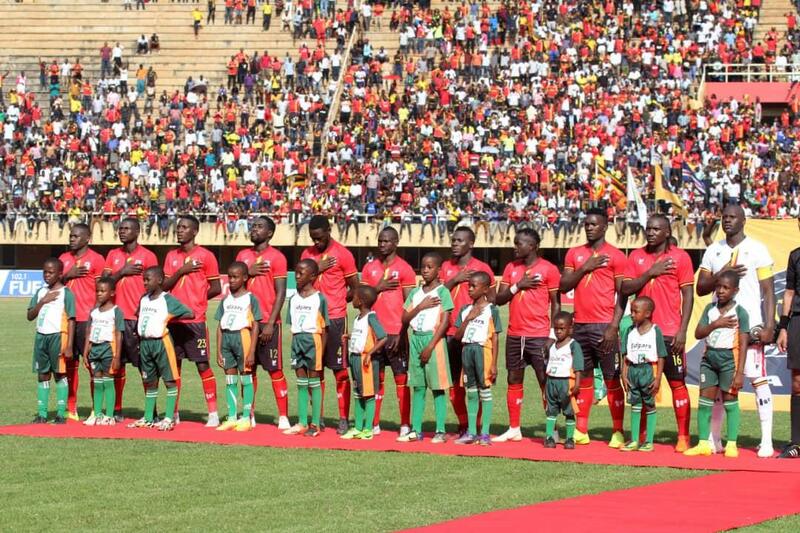 They join Uganda, Kenya and Burundi as the four East African nations to reach the June/July showpiece. In the other Group L game, Cape Verde and Lesotho drew 0-0. Robert Odongkara (Adama City, Ethiopia), Salim Magoola (Al Hilal, South), Murushid Jjuuko (Simba, Tanzania), Halid Lwaliwa (Vipers, Uganda), Joseph Ochaya (TP Mazembe, DR Congo), Ibrahim Sadam Juma (KCCA, Uganda), Moses Opondo (Vendsyssel FF, Denmark), Allan Okello (KCCA,Uganda), Edrisa Lubega (SV Ried, Austria), Muhammad Shaban (Raja Casablanca, Morocco), Milton Karisa (MC Oujda, Morocco).